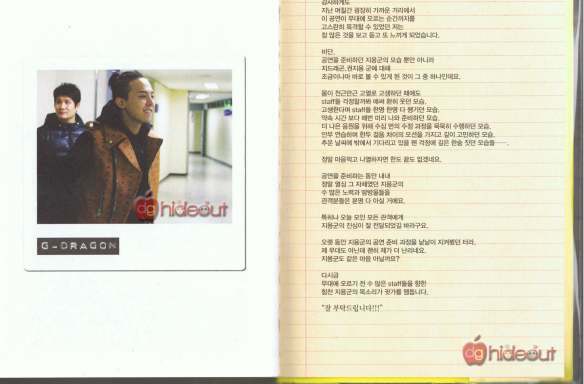 Lucky for us iVIPs, sjay.x at BBVIP.net is going to translate the whole SHINE A LIGHT book. Here’s update #1 of pages 0 – 47. On the day of the first meeting, I tried to arrive as early as possible to prepare myself for what was ahead. But first place will always go to Jiyong. He was already there way before the time of the meeting, making preparations. Just because he’s a celebrity, I thought he would come late; I felt bad for making unreasonable misconceptions. Another thing that surprised me was seeing Jiyong negotiate all the opinions brought up during the meeting by the heads of each department. I thought meetings like this would be completely led by President Yang, but the enthusiasm with which Jiyong came up with ideas and negotiated everyone’s opinions made him seem so mature. He continued to talk about all these things and more. You could pretty much feel the passion Jiyong felt towards this concert. It’s been quite a while, but Jiyong doesn’t look tired in the slightest. Maybe the phrase ‘firing away’ is used for situations like this? There were two things that surprised me a lot while watching him in the meeting. 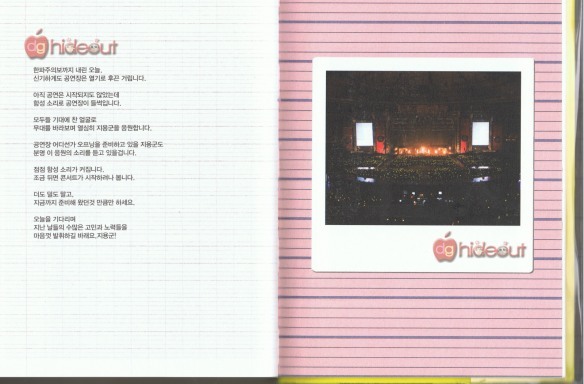 The first was Jiyong’s incredible note-taking. When I compared my notes (which even I couldn’t read) with Jiyong’s, it made me want to close my notebook. He had written the contents of the meeting so neatly and clearly, I was amazed that the long meeting could be summed up in a single page. I had heard he was quite the perfectionist, but even his writing was pure perfectionism. He chuckles and pushes his notebook towards me without a word. They say they were actually going to ask Kim Gun Mo, who featured in the song to film this video. But unfortunately Kim Gun Mo couldn’t make it on the day of the filming because of his own concert schedules. Jiyong was having a discussion with President Yang, who asked if he could do it himself. To tell the truth, I was actually a little worried about whether it would suit Jiyong’s image and if Jiyong would want to do it or not. But what? Jiyong rushes out to find himself some reggae-ish clothing and props. He returns with a bright red suit and hat, and hilarious sunglasses. God knows where he found them. He practised so hard. The staff can’t stop laughing as they monitor Jiyong’s well pulled-off imitations of Kim Gun Mo’s characteristic gestures and facial expressions. The staff member in charge of the concert’s preparation goes pale. Everyone gathers round wondering what’s going on, and wait in silence until the end of the call. Colour drains from everyone’s faces. I knew he would have the same reaction too. He’d been helping with the concert aside from his Japanese activities, squeezing in time he didn’t have. If filming was postponed in this situation where time was so short, it would obviously have a huge effect on his other schedules. Everyone’s busy adjusting their plans. It was a tight schedule, but I’m told he was luckily able to make enough time to film. You’d think the ground would give way at all the sighs of relief. Something unexpected happened the second day of filming, which had been postponed because of the fire.He had just managed to make time in his busy schedule, so everyone was more tense than usual.But the faces of both the filming staff, who had come early and had been waiting after making preparations and the Japanese staff, who had just arrived were filled with worry and concern. Yes. Jiyong had been suffering in pain the whole night. Jiyong, who likes to sleep in and usually finds it hard to wake up early in the morning, is especially having trouble getting up today. His manager senses something strange and puts his hand on Jijyong’s face. He gasps at how hot his forehead is and goes straight to the hospital with him on his back. After rushing to the hospital to get a checkup, they find Jiyong’s temperature to be around 40 degrees! It was during the time when swine flu was extremely contagious, so I couldn’t help being more worried about him. Though getting sick in itself is bad, it turns out that it’s luckily only a high fever from overwork combined with a cold. It’s impossible for Jiyong to film in this state. The doctor also repeatedly stresses the importance of resting up. Either way, it’s sad seeing Jiyong so cheerless and thin. They answer “Yes” to President Yang as he says these words through the phone but the staff sigh, worried about the sick Jiyong as well as their own schedules. Maybe it’s because the doctor suggested he eats some chocolate. Jiyong never touches anything sweet, but he’s asking for chocolate. The staff are at a loss for words and just stand there, hanging around him. The staff feel bad and grateful at the same time, a couple of them are even tearing up. Everyone looks at him worriedly, but Jiyong just smiles brightly and makes a gallant effort to walk cheerfully to the dressing room. Though he didn’t let it show, it was difficult for Jiyong to even stay standing that day. He kept getting dizzy and had to lie down or lean on a couch or chair and take a break before filming again. He looked like he was in a dangerous state. None of the staff let down their guard. When a person is that sick, isn’t it natural for them to want to stop what they’re doing whether it be work or whatever? He never says anything like “I’m sick. I’m tired.” In fact, he keeps joking around and smiling with the staff because they’re worried about him. Yes, I really think I fell for him. Eating porridge, eating medicine, eating chocolate. Eating chocolate, eating porridge, eating chocolate. Jiyong said he probably ate his whole lifetime’s worth of chocolate that day. and go back to filming. President Yang is worried about Jiyong and frequently calls the staff to check up on his condition. He even makes a hospital appointment around about when filming ends. Now that I think about it, it’s like how family members would care for each other. I used to think they were called ‘YG Family’ for no particular reason. But seeing it for myself like this, they seem more like a man looking after his younger brother, and a boy looking up to his older brother rather than the head of a company managing his singers….. It really made me feel like they were a family. It seems they’re not ‘YG Family’ for nothing. Their strong bond makes me a little jealous, actually. All the staff cheer after the filming of the last scene for the music video. I’m sure they were all grateful that Jiyong put so much effort into the filming despite being sick and everything, but the last scene really did depend on Jiyong’s acting skills. I was relieved to see him joking around that being so sick allowed him to express the right movements and emotions for such a dark and twisted scene. 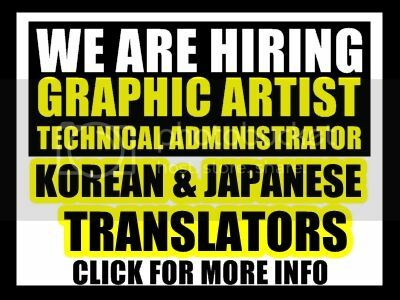 As the director and all the staff monitor the final result and yell “Great! The best!” expressing their satisfaction, Jiyong smiles brightly despite having struggled throughout the whole day.But as more time goes by, it seems like both the chocolate and medicine have lost their effect; He’s looking sick again. We decide to leave the rest of the scenes for another day and focus on saving Jiyong first.Let’s play a game of ‘Find It’ now! Because they had to push ahead with filming until late night, there was one scene Jiyong was unable to film. Which scene could that be? I’ll give you a clue..it’s a couple of pages ahead of this! They’re filming the opening video for the concert now. I’m told the opening outfits were made even earlier than usual for the purpose of this filming. It seems like there’s so much that has to be done before the actual thing. I used to think it was just bam, and they hold a concert just like that. But there’s so much preparation involved, so much filming…. If only everyone could be in more than one place at once. Jiyong has been sick for a while so he’s still being accompanied by porridge, medicine and chocolate. Seeing him eat and take his medicine so consistently made me realise how professional he really is. As usual, he checks everything from monitoring his own performance to even accessory settings. I seriously have no idea where that determination comes from. He must’ve been really tired. When he’s given a short break because of the change of set, Jiyong sinks deep into the couch and nods off to sleep. He’s not the type of person to let on that he’s having a hard time, so whenever he said he’s fine I used to really think he was. Of course the concert’s important too, but I would really like Jiyong to get better soon. For the ‘halftime inspection’, the staff have all gathered again for a second meeting. The thing that I found kinda weird was that though most artists contact the staff through their managers, Jiyong calls them all himself. He continuously checks up on all these countless things himself, then makes changes and improvements…….. It might be that he’s paying particular attention because it’s not Big Bang but his own; This is G-Dragon’s concert. Maybe that’s why he doesn’t let even the most minor details slip. After the meeting, G-Dragon seems totally lost in thought. I bet he feels worried as well as a little pressure, and anticipation on the other hand too. The really amazing thing is that he manages to cope through all this alone. Of course I know Jiyong isn’t the only one working hard for his concert, but seeing him pay attention to every little aspect has cleared up all my misconceptions about him. Jiyong said he watched ‘Peeping Life’ whenever he was bored in Japan. I can still remember the excited look on his face when he was first given the suggestion of filming his own. He said he hasn’t missed a single episode, and vigorously came up with ideas during the planning meeting. Though of course some parts would’ve been exaggerated to an extent, they ended up with a conte based on Jiyong’s real experiences and ideas. Seungri filmed for a while (?) on this day too. Jiyong says he’s hiding while watching Seungri film in case he disrupts him in any way. We tell him to go wait in the car in case he gets a cold but he remains stubborn that he can’t do that when Seungri’s out there doing his best for his concert video. Though Jiyong himself has appeared exactly as he is, Seungri’s been getting his hair and make up done since early morning. He chooses the most expensive outfit he has and appears at the scene. A suitable appearance for the lead. It wasn’t originally part of the script, but Seungri keeps insisting that they have to create a dramatic atmosphere. The staff have been complimenting him on his enthusiasm (and almost greed) for acting, you see. Suddenly, Jiyong stands up and walks off to his room. Even for Jiyong…he wouldn’t really like the idea of pretending to be possessed by a dog, right? He’s probably pissed. But I spoke too soon. The staff in the dorm crack up. “Jiyong oppa is….like a walking idea bank. His thinking is always different to everyone else’s so I think he has a talent in trying things that others have never even thought of, and recreating normal things into something special and amazing . During our Fire days, he taught us a lot of motions and facial expressions that we hadn’t thought of. It made filming the music video a lot easier for us. Despite being busy, people have readily made time to help Jiyong with his concert video and have shown amazing acting skills. These people include 2NE1’s Sandara, CL and Minzy, Big Bang’s Daesung and Seungri, and Bongsun. Especially because Jiyong isn’t close with any female celebrities other than the ones in YG, he was a bit worried about who to cast as the role of ‘The girl he meets at a blind date and falls for at first sight’. She accepted right away and really brightened up the mood at filming. But the second they started filming, she would transform into a proud, cold-hearted woman. Although it was only a short amount of time, everyone looked like they were having so much fun. Oh yeah, and the ‘shoe shop’ story was actually based on a Jiyong and Seungri’s real experiences. Jiyong appears with a strong, clear voice and a nearly-90 degree bow. He smiles brightly at the band sessionists, greeting every individual one and saying over and over again how he hopes they’ll all do a great job today too. One of the staff who says he’s been working with him since he was a trainee says he’s always greeted people like that since he was young. It might be that he’s done it so much that it feels natural now, like a habit, but it definitely makes other people happy when they’re greeted in such a bright way. So, shall we start our practice as cheerfully as always? Even during his Japanese promotions, Jiyong consistently calls the staff and engineers to check up on the sound and setlist. People who don’t know him say he seems hard to work with (I confess I had the same misconceptions before actually meeting him), but when you get to work with him, it’s actually even more fun and comfortable than working with anyone else, not to mention how grateful we all are that he always listens to the staff’s requests. I was worried that he’d find them bothersome, or that he’d be overly sensitive to feedback but looking back, they were really pointless concerns. He’s so courteous and tries to pay attention to every member of the staff. I think that’s why the staff also try even harder to do better for him, so the atmosphere is always warm and friendly. The staff are in awe at Jiyong’s sudden suggestion. Though it may not seem like something that amazing depending on the person, Jiyong often comes up with such sudden and brilliant ideas. Because he knows even more about the progress of the concert than the staff, sometimes he can even be seen jokingly boasting to the stammering staff. “To me, G-Dragon is a dongsaeng who’s like a friend. He’s always cheerful and though he may seem immature, he’s actually an old grandpa! I’m told that he and the dance crew he’s always with can communicate just by looking at each other. While I was watching them practice, seeing him get along so well with every person in the dance crew made me think: “This must be what he’s like when he’s ‘Kwon Jiyong’ and not ‘G-Dragon’”. “I was Kwon Jiyong before my debut, but afterwards I became ‘G-Dragon’ to some of my friends…………. It makes me so sad…………….. If someone finds me uncomfortable to be with, I think I feel the same way too. So I find myself not being able to meet the friends of mine who find my presence awkward and uncomfortable. But the rest of my friends……………they’re my real friends. We always joke around and hit each other playfully………..it’s so much fun. It may seem like nothing to other people, but to me it’s the most fun thing in the world. Maybe that’s why dance practices are so fun for Jiyong. The dance crew is made up of only his ‘real friends’. Whenever they’re scheduled to return from Japan, Gaho has to be taken to Big Bang’s dorms. This is because it’s G-Dragon’s small wish to be greeted by Gaho when he returns. Once, Jiyong’s mother sent Gaho to a dog training school to fix all his small habits while Jiyong was in Japan. If you think about it, it was an obvious result that Jiyong jumped with rage when he got back from Japan. After realising too late that Gaho had been sent off to training school, Jiyong demanded he be brought straight home, worried about Gaho who would be alone in a strange environment. But after listening to his mother’s logical explanation of ‘Why Gaho Needed to Be Trained’, he wordlessly gave in. She said that because he couldn’t be with Gaho all the time, he at least needed to let him learn to cope by himself when he wasn’t around. But even so, Jiyong seems to be missing Gaho to death. The Jiyong I saw at practice was different to the one I see on TV or at concerts. It wasn’t the glamorous and charismatic leader of Big Bang, but Jiyong the trainee from the past, practising to death and sweating like no tomorrow, putting his all into every moment so not to miss anything. You’d think he’d be totally exhausted by now, but even during his breaks he’s busy checking the formation and flow of the dance crew, and stuff like that. ‘Look Only At Me Part.2’, sung by Jiyong and Taeyang. They probably don’t even need words to understand each other. When the two of them are talking and laughing during their breaks, Jiyong seems to talk more and even act a little cuter around Taeyang. But when the music plays, both their playful sides vanish and they focus entirely on the practice session. Gahh…I really do want to look only at Jiyong and Taeyang…. For Jiyong’s fitness and strength during the preparations of his concert, his mother makes him beef soup. Jiyong has been eating this beef soup every single day. I don’t know why but when you think of Jiyong, you’d think he’d like foods like spaghetti and pizza…. but it turns out he really likes Korean food. He manages to survive until the end of the concerts thanks to his mother’s beef soup. Maybe he ate it a bit too much though? But even though he whines, he always manages to finish a bowl of his mother’s beef soup just like that. Jiyong has been in beef soup-appreciation mode lately. “I think that as a hot icon, it isn’t surprising at all that cute Jiyong steals the hearts of fangirls. And it’s also great to always see him confident…Working really hard but really letting loose when he’s on a break! That’s his style. At most concerts, I heard that the guests just come to the rehearsal on the day to check up on the overall flow and practise a few times. G-Dragon’s concert must be a total exception. Everyone comes to practise with Jiyong basically every day as if it were for their own concerts. The members of his YG Family will probably be moved in a slightly different way watching this concert; Jiyong will be standing alone on stage after ten years of practice, after debuting as Big Bang, but as the solo artist G-Dragon rather than the leader of Big Bang. So maybe that’s why they’re practising so hard as if it were for themselves? When we arrived at the stadium to get ready for rehearsals, Jiyong ran his eyes over the empty seats and was silent as he went around the insides of the concert hall. Even I feel almost lonely looking at the empty concert hall. I wonder what Jiyong’s thinking at the moment? As soon as he’s given the chance to have a short break, Jiyong lies down on the spot. He raps while flailing his legs like a cranky little kid. The mic in Jiyong’s hands has been custom-made (?) to fit the concert’s main colours of red and white. Engineer Kyeongjoon went and bought the materials and made it himself to fulfill Jiyong’s request. It’s really one of a kind. The atmosphere suddenly becomes cold. The look on G-Dragon’s face says a lot as he watches the rehearsal video. Though everything seems perfect from an outsider’s point of view, not even the tiniest flaws escape G-Dragon’s eagle eyes. Everyone watches G-Dragon in silence, waiting and wondering what it is that’s gone wrong. As G-Dragon points them out one by one and explains how to fix them, even I flinch like a student being told off by a teacher. Though I know I don’t really have the right to say this as an outsider, it’ll probably actually only make 1 or 2 seconds’ difference. It’s both surprising and scary that he notices and checks all these tiny things. He really isn’t called a ‘crazy perfectionist’ for nothing. His face was expressionless so I was kind of worried that maybe he wasn’t happy about something, but suddenly he cracks up and falls to the ground laughing after looking at the huge screen. What is it that’s making him laugh so hard? He looks just like a mischievous little kid. It really makes me wonder if it’s the same expressionless person who was monotonously pointing out problems a couple of seconds ago. I look at the big screen, wondering what it is he saw. And I see a video of a young Jiyong enthusiastically rapping (you can’t understand much of what he’s saying but yes, he’s still rapping) to ‘Angel with Lost Wings’. He laughs while watching his younger self, then covers his face with both his hands bashfully before flopping to the ground as if he can’t bear the embarrassment. He does seem pretty embarrassed. “What do you want to become when you grow up, young Jiyong? I see you’ve accomplished that dream already, young Jiyong! Let’s take a second here to watch and compare the child Jiyong with the adult G-Dragon. He checks the formations on stage, as well as lighting, sound, video and even special effects……. We see Jiyong continuously talking to the directors of each team in order to create a better performance. Seeing his concern for all his fans was the most impressive thing of all. Though I’m sure he’s doing it for himself as well, seeing him put his loving fans first was truly more impressive than anything else. Around about when the rehearsal was nearing an end, we see Jiyong way over there with a serious look on his face. Seeing him sitting there, silently staring at the stage makes me feel a surge of pride and almost pity at the same time. I know he would’ve had one of the hardest times managing this concert, but he never once let it show and instead always encouraged and cheered on the other staff members. It was inspiring to see him act so much more mature than his age. Even after hours of rehearsing, Jiyong doesn’t seem tired at all. Countless staff members are continuously putting in a lot of effort for Jiyong’s concert, and Jiyong himself is also probably having a hard time having to decide and prepare everything on his own too. As G-Dragon alone, not as one of five members of Big Bang. I wonder what it’s like to stand alone on stage in front of over ten thousand people. Not with the other four members like he has until now, but really, I wonder what it feels like to perform alone on such a huge stage. I snuck on stage next to Jiyong, who was busy discussing something with the staff. I faced where the audience would be, then found myself running back down from the stage not even a minute later. It’s impossible for me to imagine it. I suddenly have a new found respect for Jiyong, standing tall up there on stage. Jiyong, you said you were shy……That was all a lie, wasn’t it. Because the rehearsal’s been going late into the night, a lot of the staff are starting to look tired. I mean, I’ve just been sitting here comfortably watching everyone else work, and even I feel tired. It makes me wonder how hard it must be for the others at the moment. Then, we hear Jiyong’s strong voice. Everyone chuckles at his subtle cuteness and goes on working hard as if they’d never gotten tired in the first place. 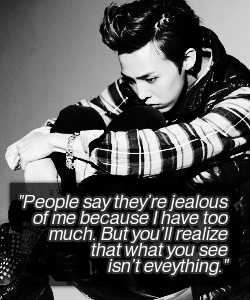 If you smile and say stuff like that, noone will ever be able to complain, Jiyong. Tada! A pleasantly familiar face appears. It’s Se7en, looking hot as ever. “Wow, it’s been over 10 years since I’ve known him. Even after debuting as Big Bang’s leader and now a solo artist, he always puts in the same amount of effort and is always trying to do something new. He’s a dongsaeng that has a lot of qualities to learn from. It suddenly becomes a little chaotic at the rehearsal site. A bunch of girls rush inside, anticipation etched on their faces. I hear they won some event and were given the chance to watch the rehearsal. They look so excited, and they scream like no tomorrow when they see Jiyong rechecking formation on stage. Jiyong hears them and runs off the stage to where they’re standing and greets all of them eye-to-eye. The girls just stand there stamping their feet, at a total loss for words. It’s really cute. Jiyong continues rehearsing, standing where the fans can see him well. Jiyong performing in front of his fans, who are all watching with a twinkle in their eyes, is probably the brightest I’ve ever seen him shining. Daesung and Seungri watch the final rehearsal. Their serious expressions make it seem like they feel even more nervous than Jiyong. And he likes being different to others in everything he does. “No matter what anyone says, passion never lies. These are pages 272-353 (last page). It’s finally the day of the concert. Jiyong doesn’t even look nervous, just chilling out…so why is it that I’m shaking? I will announce today’s weather. For the first time in ages, it’s a cold wave.It’s just so cold today. I went outside the concert hall for a while and came straight back in because of the cold, but I saw fangirls lining up 2, 3 hours before the start of the concert.Maybe they forgot the cold because of anticipation for the concert. They were all smiling brightly. Sure enough, Jiyong is worried about his fans waiting outside. Taeyang reassures the worrying Jiyong. The waiting room is filled with joy and delight, like a huge family that’s gathered together for New Year’s Day or Thanksgiving..
Everyone’s checking Jiyong’s condition, making sure he hasn’t missed a meal or anything, how he’s feeling, and the room buzzes with the sound of all the continuous questions and answers. On one side of the room, Jiyong is posing cutely in front of the camera. I’m soooo nervous for him. But Jiyong, how can you be so relaxed? But I’m sure Jiyong’s shaking on the inside too. You’re just acting like you’re not, right Jiyong? Due to Jiyong’s request, Gaho is brought to the waiting room on the day of the concert! Out of the people entering the waiting room, there were even occasionally a few who went straight to Gaho before Jiyong. But Gaho would just glance at them once before looking away with that distinct chic expression of his. He’s pretty much as popular as Jiyong himself. In that noisy concert hall, I repeated the pattern of eating and sleeping while occasionally silently watching Jiyong perform. Though the occasional firecrackers scared the hell out of me, I got used to it after a while and they didn’t bother me in the slightest after that. You could really tell how much Jiyong loved Gaho; Even though he was outrageously busy, he would take the time to pat him, hold him and hug him, and even give him snacks. Can you imagine how much he cares for him? They say envy is the greatest form of defeat.. Argh……. I see Taeyang, who will perform with Jiyong in the concert. He worked really hard to prepare for this, and he was never once late to practice. People call Taeyang a ‘model student’. During the preparations of this concert, the way Taeyang kept checking the formation and chereo until the very last rehearsal made it seem like he was doing it for his own concert. It’s Teddy, who always came even to choreo practices to check the floor plan and formation, and never hesitated to give Jiyong sincere advice and feedback. Sure enough, he arrived early on the day and after finishing preparing for the last rehearsal, he goes to the waiting room and jokes around with Jiyong who I’m sure is very nervous…right?! Even in the waiting room, Jiyong matches parts of the choreo with others, or rechecks the order of things on the cue sheet, or checks every single outfit and prop. A lot of people have come found him to cheer him on, and every time that happens he smiles brightly as he thanks them. Maybe Jiyong is a little nervous after all. He keeps checking the time. Instructor Hwang calls Jiyong over in the middle of preparations. He suddenly turns the waiting room into a fitness centre. Jiyong does a short simple exercise with equipment that the Instructor has brought in advance, and a chair. Instructor Hwang, who brought exercise equipment for Jiyong to work on his fitness with even just before his concert. Jiyong, who follows through and exercises without a word of complaint. Both of them are just incredible. As the concert time approaches, everyone gets busier. On one end, Taeyang’s fixing his lines. He’s crossing out and rewriting stuff over and over and again, and at a glance he looks like a boy entering an essay contest or something. The stylist altering his clothes at the speed of light, H.O.D’s doing his hair and make up, managers hectic because of the continuously incoming phone calls, food teams repeatedly checking and rechecking the prepared food in case it runs out. Eventually, someone even starts running. Even I’m this anxious and I’m only a spectator, I wonder how nervous Jiyong is? It’s 15 minutes before the beginning of the concert. I see Jiyong calmly collecting himself, even amongst all the frenzy. The staff surrounding him are all cheering him on. So are the others who participated. Jiyong, who’s probably the most nervous at the moment, just waits and prays silently until the moment when he has to go up on stage. It’s a cold wave today. But strangely, the concert hall is heated with all the excitement and fever. The concert hasn’t even started yet, but the hall radiates with all the screams. They’re cheering Jiyong on, anticipation etched on all their faces. I bet Jiyong’s hearing those cheers as he gets ready for the opening somewhere in the hall. The screams get louder. It seems the concert’s gonna start soon. Not more, not less, just show them exactly how you’ve practised until now. I hope you can really show all your worries and efforts in the days leading up to this moment, Jiyong! “Jiyong’s like an empty piece of paper. When it’s Jiyong, I always want to try different things, I want to make something new. “While planning the entire concept for the concert and stuff, the most important thing was variety. I wanted to show how many different styles one artist could show. Not just in music though, I wanted it to be a perfect match with the outfits, hair and make up too. YG Engineer Kyung Joon probably did the most work for this concert. He even made the mic used for the concert. “I’ve known him for a while but he executes everything so amazingly that even though he’s younger than me, I have a lot to learn from him. Because of this, it makes me more in love with GD. You just don’t know how i love GD, while reading, I couldn’t helped but have a teary eyed, Thank you so much for sharing. I will love, support and respect Kwon Jiyong forever. I know one day I will see you in person GD. May the Lord always guide you, and give you great wisdom to be a great artist as what you are now. May you always in good health. Good luck in all you endeavor. i may be a few years late with my thoughts but still… he is the kind of person who is WORTHY of who he is and where he is at. NOBODY better say that he is like any other idol out there.. HE IS NOT! he is one of a kind. the passion and love that he has for his craft is one of a kind. GD! you are a blessing to this chaotic world. Personally.. even if i don’t understand your lyrics without consulting google translation (kekeke) i love listening to it. Just the beat alone has a calming effect on me. i was happy and sad at the same moment i found out that BIG BANG is going to have a concert in the Phil. happy coz you will be performing very near but sad since a single mom’s salary is not enough to watch you. nonetheless, i wish you all the BESTEST (if that is even a word) in life. stay healthy.. and if you and the rest of BB wants to escape sometimes.. my island is open to you and you can hide here and just be yourselves. GOOD LUCK!